Check out our 90+ OnDemand resource library! These short courses are no longer offered for contact hours/CEUs, but contain relevant and valuable information to hone your IM skills and move your practice to the next level. Simply click on the category below, and it will expand to reveal each course title, description, and agenda. Start learning today! Now you can tailor your continuing education to what you need and obtain a reward for doing so! Complete every course in a category to earn a badge that will be posted on the provider locator board to show off your educational achievements. You must successfully pass a post-test and complete an evaluation of each course in order to earn the badge. While you’re here, check out our FREE webinars. These don’t earn rewards, but they are full of helpful information for getting started with IM and how to ensure clinical profitability with IM training. Register for Our Featured Webinar Today for FREE! Learn about the research behind IM in this free introductory webinar. 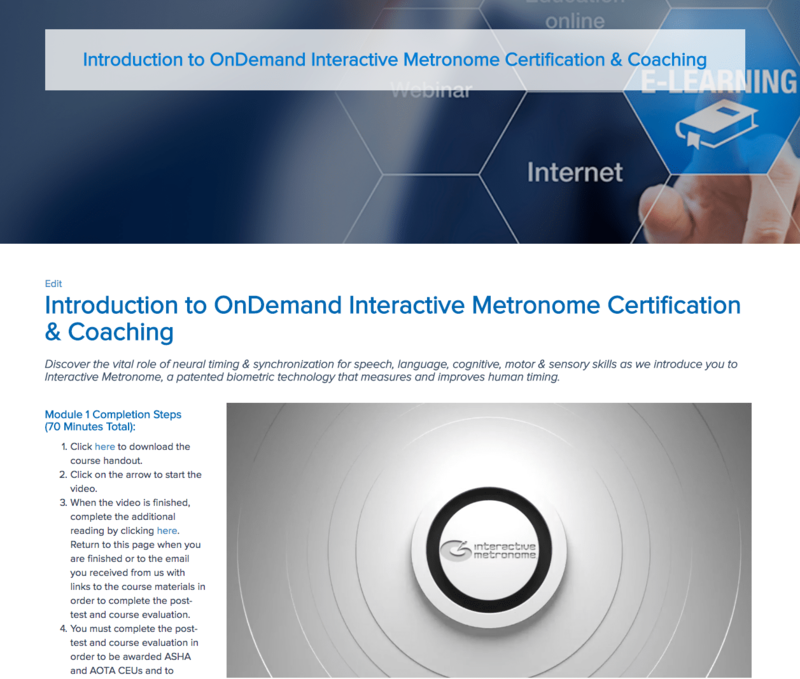 In this introductory course, featuring Module 1 of the OnDemand IM Certification & Coaching Course, you will be introduced to the science behind the Interactive Metronome. Please note that completion of the full Interactive Metronome OnDemand Certification & Coaching Course (8 modules) is required to become IM Certified. Check out these FREE Courses from Interactive Metronome®! There is no time like today to get started with IM training. Our free courses cover the science and research behind Interactive Metronome®, how to get started with IM training, clinical profitability and virtual training with IM-Home. If you want to find out more about IM and earn Contact Hours/CEUs, then these courses are for you! IM has always been an invaluable tool for parents and educators, and these webinars outline how to incorporate IM training into a school setting. We cover everything from summer camps to writing IEP goals in these educator focused webinars. This course will cover various academic settings and will equip IM providers with the necessary tools for transitioning to the next step in Interactive Metronome use – whether it be related to finding funding, communicating with school administration, or fine-tuning an already established IM program in the schools. In this course, you will learn more about what executive function is and how it is essential for success in academics and social relationships. We will briefly touch upon the relationship between movement and the development of executive function, and you will learn practical ways to incorporate specific movement activities within IM sessions to improve executive function. This course is not offered for contact hours/CEUs. Learn the importance of setting individual goals for patients, regardless of their diagnoses, based upon the desired outcomes.Learn examples of best practices that can be used in conjunction with basic Interactive Metronome training to enhance outcomes for goals related to active working memory/mental manipulation, auditory skills, visual skills, sequencing, inhibiting initial responses, anxiety and hemispheric integration. This seminar will be about how my company, Accelerated Learning integrates IM into my Summer Intensive Learning Camps. I will explain the premise for the camp, why I started the camp, the success rate and show the improvements from the camp after two weeks. After attending this conference, you will be able see how you can use Interactive Metronome’s rhythm and timing skill development to meet specific SMART Goals/Objectives by targeting the underlying foundational skills. So You Want to Write a Grant for IM in Your School? This course will describe the framework for writing grants to fund technology equipment such as Interactive Metronome. It will tell you the steps to take to find the possible funding sources, the typical formulas used in writing grants and the insight to read rubrics for whether you are a candidate for the grant being offered. This course will offer solid information that can be shared with parents, teachers, and administrators about the importance of timing & rhythm for learning. Newsletters, presentations, web blogs, and conversation starters can be the avenue to getting the message across. This course will cross parameters when the Speech-Language Pathologist, the Occupational Therapist, and the Physical Therapist work collaboratively in planning and implementing treatment protocols to extend rhythm into their work with clients. Using rhythm to extend the work of Interactive Metronome to specific target skill sets across the Related Services. Autism Spectrum Disorders present a unique set of challenges. Children deal with a wide range of symptoms and require very different treatment plans. These webinars will help providers who work with children that have this special blend of social and communication troubles. – Part I will address the client population and strategies to identify good candidates. This one hour course will cover three main areas: 1) Which autistic clients are appropriate candidates for IM training; 2) Why you should consider training the autistic client in an intensive fashion; and 3) IM Equipment settings for optimal performance with this population. Course material will be in power-point style with easy to reference lists and learning tools. Photographic and video examples will be presented to illustrate salient points and to reinforce learning. – Part II will address training strategies for optimal performance. This one hour course will cover three main areas: 1) Handling emotional outbursts and sensory overload with the autistic client; 2) Setting up the training environment for optimal performance; and 3) A sample client protocol and training. Course material will be in power-point style with easy to reference lists and learning tools. Photographic and video examples will be presented to illustrate salient points and to reinforce learning. Brain injuries can occur anywhere, anytime and to anyone. Whether it is external trauma, disease or a stroke, lingering effects on the brain can rob someone of his or her quality of life. Restoring that quality of life for brain injury patients is the goal of these courses. The therapist working with the Traumatic Brain Injury patient must modify the Interactive Metronome modality to account for muscle tone, poor coordination, decreased cognitive functioning, poor frustration tolerance, aggressive behaviors and fatigue. This course will review the phases of IM treatment with adaptations specifically pertaining to the needs of the TBI patient. Share and review advanced techniques to facilitate patient participation, patient success and to facilitate the progression towards achieving functional goals. The goal of this course is to offer clinicians with innovative research based treatment approaches for the using the Interactive Metronome with the patient with a TBI. This course provides the certified IM provider with advanced rehabilitation techniques and training specific to the use of Interactive Metronome and the treatment of stroke and TBI patients. Best practices will be shared in this presentation along with practical examples and video demonstrations. Stroke is the leading cause of serious long term disability in the United States. Each year approximately 795,000 people suffer from a stroke. This course is designed to expand therapist knowledge of IM as an effective treatment tool for stroke rehabilitation. We will discuss the treatment phases and how they apply to this population and provide treatment ideas to enhance your treatment sessions. The Interactive Metronome can be an effective tool for treating individuals with a traumatic brain injury. People with brain injuries suffer from deficits in a variety of areas including motor, sensory, cognition and behavior. Deficits in these areas greatly affect people’s ability to communicate and to fully participate in their ADLs and IADLs. The Interactive Metronome can positively impact a person’s recovery. This presentation will includes specific case examples of IM treatment with TBI. These deficits often require skilled intervention to reconnect the superhighway of the brain. Basic fundamentals needed to reconnect these higher level cognitive skills include timing, synchronicity, and focus – which are also some of the fundamentals of Interactive Metronome. Learn when and how to introduce IM into treatment sessions with this unique patient population. Intertwine traditional neuro-cognitive treatment with the IM modality to provide the most comprehensive treatment program for your patients. Initial findings show that IM therapy significantly improved Attention, Immediate Memory, and Delayed Memory functioning. Indicators of neuroplastic change suggest that brain changes due to IM therapy account for large portions of the variance in neuropsychological test performance. Six month follow-up data are currently being collected. Preliminary results were published in the journal Neuropsychology in 2013 with additional publications pending completion of the study and further analysis of electro-cortical and follow-up data. The purpose of this course is to advance your clinical knowledge & implementation of the Interactive Metronome® (IM® ) within the healthcare setting. Participants will learn how to adapt use of the Interactive Metronome® for low-functioning patients encountered in acute and sub-acute rehabilitation settings in order to address underlying neurotiming® deficits that impact communication, cognition, and motor function. Specific strategies to facilitate successful IM® training and outcomes will be discussed. This course will be based on a case study that allowed a client to participate in this IADL when traditional therapies failed. These patients are perfect candidates for integrating Interactive Metronome (IM) into rehabilitation in order to target executive functions, memory, thought organization, and various levels of attention/concentration by addressing critical mental timing, rhythm & neural synchronization (AKA temporal processing). Introducing more advanced cognitive-communicative exercises along with Interactive Metronome at the right time in the rehabilitation process can facilitate faster recover of function and return to the community. There are many benefits to providing therapy in a group setting, including peer support and opportunities for natural communication. A core skill that underlies speech/language and cognitive/linguistic abilities is that of mental timing or what is referred to in the literature as temporal processing. The Interactive Metronome (IM) is a treatment program that specifically addresses the timing skills that form the basis for communication and language. IM can easily be incorporated into a group therapy format to facilitate both group and individual goal achievement. This course will focus on rehabilitation of adults and will outline how to plan, organize, and perform activities for a group with emphasis on improving timing, cognitive skills, and/or communication skills. It is well established that the rate of development is most rapid during the preschool years. Early intervention is critical to prevent or minimize the future impact of disability. These webinars are great for anyone working with infant & toddler populations that may already be showing signs of developmental delays and motor difficulties. Additionally, the hands-on approach to IM training that has been so successful with young children has also been shown to be effective for older children and adults with severe disabling conditions. The Interactive Metronome (IM) in has been used as a speech therapy modality in The Language Learning Center, Inc. for approximately 8 years [at the time of this recording in 2009]. Initially used primarily with clients exhibiting learning disabilities, difficulties in recognizing language components and processing delays, the treatment has now been expanded to provide IM to clients with more profound medical diagnoses, such as Asperger’s, Autism, seizure disorders, etc., who did not fit into the typical age expectant, physical ability profile that her prior clients fell within. Results of IM treatment on this population were amazing, particularly in the areas of auditory concentration, focus, verbal understanding and ability to interact appropriately in family/social settings. Working with these specialized populations showed the principles of IM therapy are effective even when maximum tactile assistance, positional modifications and individualized client reinforcements were required. This willingness to take IM “out-of-the-box” and the consistently amazing results lead to the development of a modified protocol to treat a 22 month old diagnosed with Agenesis of the Corpus Collosum. Ongoing treatment and study of this child has resulted in phenomenal gains in gross motor, fine motor and speech, astounding her parents as well as her PT and OT therapists. Research papers and references pertaining to Interactive Metronome, temporal processing & neural synchronization can be found at www.interactivemetronome.com. Click on SCIENCE. This presentation will review the basic principles of Interactive Metronome as they relate to motor control and functional movement. Hand-over-hand use of Interactive Metronome will be discussed for use with a diverse group of clients including infants, toddlers and clients with severe physical and/or cognitive impairments. Treatment options for working with movement disorders such as cerebral palsy and developmental delays will be reviewed. The use of IM for the reduction of spasticity and startle reactions will also be discussed. IM isn't just for the use in the clinic. It’s completely portable & is a very important part of the treatment plan for home healthcare & skilled nursing facility patients who are trying to get back on their feet again after an injury or illness. Learn how IM training can motivate clients to participate in therapy, decrease missed visits, and accelerate treatment outcomes. Interactive Metronome (IM) is rapidly becoming a standard of care & valuable treatment tool in the skilled nursing environment, capitalizing upon the critical role mental timing plays in the rehabilitation of communication/language, ability to perform ADLs, functional mobility, and safety awareness/judgment. This course is designed to teach the clinician to accurately identify candidates for IM and to develop appropriate treatment plans that take into consideration the medical conditions and functional needs of skilled nursing residents. See how IM lends itself to being used throughout a therapy session in flexible and creative ways to both motivate patients and encourage greater independence. This course will outline therapeutic activities and techniques that therapists can easily incorporate into therapy tomorrow. This course will discuss the use of IM in the Home Health Care setting. There will be emphasis on specific treatment ideas, positioning, and modifications needed to address the vast diversity of clients encountered in Home Health. We will explore traditional and non-traditional ways in which to integrate IM into therapy plans of care and how to incorporate a transdisciplinary approach to improve all functional outcomes / patient goals. I will explain why I feel that EVERY patient could benefit from using the IM. You will learn how to tailor each session to the patient’s specific needs. You will teach the patient to set the bar higher each session. You will learn to change the program to accommodate the patient when they are having those “rough days.” Ever wonder what to do with that low level patient or the physically high level, but balance challenged patient? You will learn fun and creative ideas to get your patient engaged in treatment. Throw out the rule book for home therapy and discover a new plan. You are only as limited as your imagination. I will discuss a fun and exciting approach to exercise in order to return the patient to his/her prior level of function or better. You will learn how to co-treat with multiple disciplines in 1 visit, and you will learn to encourage the patient to continue his/her training with the IM Home. It is important to tailor services to children, who may not have the strength, attention and cognitive development necessary to complete some IM tasks. Being flexible is the key to success and we've got plenty of information on unique strategies to use with IM assessment & training. moderate to severe physical and cognitive challenges who previously had very limited functional gains. It has proven to be the catalyst that many children need in order to readily initiate play and social interaction, improve coordination, self-regulate and improve communication.Using IM with this population requires modification of each of the traditional program components. This course will address methods in which to accomplish this in the areas of pre and post assessments, as well as treatments. There will be emphasis on specific treatment ideas, positioning, use of alternate switches and methods to grade progression of interaction with IM while remaining in Phase 1 of treatment. Specific case study examples will be discussed to illustrate modifications and treatment suggestions. The importance of an effective assessment and understanding of a clients cognitive, emotional and physical processing strengths and weaknesses cannot be understated. Drawing from his extensive experience, the presenter introduces an effective and efficient tool for the evaluation and analysis of the pediatric clients participation in the Interactive Metronome Assessment. This course will cover the interviewing process, initial problem solving and new ancillary assessment tool he created that is sensitive to cognitive, speech, neurological and physical performance. Each aspect of the assessment will be discussed and practiced by the audience and will be assisted by video’s to illustrate each of the performance areas. Innovative Pediatric Practice with IM – Part 2 Developing the IM Treatment Plan: The analysis of the client’s performance during the IM long or short form and how it relates to Speech, OT, PT and Education frame of reference and practice is critical. Once attendees have mastered the scoring of the newly introduced Pediatric Interactive Metronome Observation Tool, they will learn how to analyze this data and develop a treatment plan. Understanding how processing strengths and weakness relate to function will assist the IM provider in maximizing the clients learning experience. Attendees will learn how to analyze the IM raw scores and observation tool and develop a treatment plan that addresses their clients cognitive, emotional, sensory and physical challenges and uses their measured strengths to facilitate their progression through the treatment plan. Innovative Pediatric Practice with IM – Part 3 Implementation Strategies to Maximize Your Client’s Progress: It’s not enough to just have a good understanding of a clients cognitive, emotional, sensory or physical processing. The ability to match the clients strengths and weaknesses with advanced best practice techniques will enhance the quality and effectiveness of your treatment plan. This course will demonstrate with video’s and descriptions the techniques that address challenges and strengths identified in the analysis of IM scores and the Pediatric Interactive Metronome Observation Tool. Taking these tools and implementing them into the phases of IM training define IM best practice and the value of this approach for the pediatric client. The strategies used can be applied to groups of any age or population. How to make the best use of group dynamics will also be discussed in respect to keeping individuals motivated as well as how they can work together. This presentation will focus on identifying key components to successful group programming, including identifying appropriate patients, writing programming objectives, and selecting appropriate treatment activity ideas. Advanced diagnostic images show a pattern of hemispheric imbalance among the brains of children and adults with diagnoses of ADHD, Dyslexia, and Autism Spectrum Disorder. This course introduces the certified IM provider to the concept of hemispheric imbalances in children and adults and how to address these imbalances using the Interactive Metronome. regard to developmental delays and diagnoses, or are seeking a performance edge related to sports and athletics.This one hour course will cover three main areas: 1) Who is a candidate for an intensive training; 2) Why you should consider training in an intensive fashion; and 3) How to set up your IM training protocol so that it is tailored to meet the individual needs of the high performing client. Course material will be in power-point style with easy to reference lists and learning tools. Photographic and video examples will be presented to illustrate salient points and to reinforce learning. With exercises, proper execution and perseverance are generally of paramount importance: it is important to ensure clients do them right and keep doing them. With activities, simplicity and ease are generally of paramount importance: it is important to remain gentle and encourage clients to use as little effort as possible. This course will explore three basic questions that are important to consider as part of any Interactive Metronome program to ensure success: 1) What are some common difficulties client’s encounter with IM activities? 2) What activities can be assigned for homework to help these clients through those difficulties?, and 3)How can you introduce these activities to your clients within the context of IM sessions? critical for speech and language, cognitive abilities like focus, memory, reading, and learning, and motor coordination. Alongside IM, additional tools have been adopted to develop auditory frequency reception and expression. Arguably, the most fundamental feature to which the auditory system is attuned is frequency. Several researchers have developed the idea that frequency is the auditory analogue of space in vision, in part because of the way in which sensory transduction occurs; whereas the retina and primary visual cortex are organized spatiotopically, the cochlea and primary auditory cortex are organized tonotopically. Frequency, along with time, are the two “indispensable attributes” of audition, whereas space and time are the two indispensable attributes of vision. (Kubovy and Van Valkenburg, 2001). In the presentation, providers will further analyze the components of each frequency reception with time perception, their neurological constructs and influence upon development, recovery and performance. Participants will be able to identify key components of each construct and apply such principles to overall treatment planning. We are now armed with more information about these new technologies and how they alone fit into the treatment picture, but do you ever wonder how best to combine these interventions. Following this presentation, you will be better equipped to formulate sound clinical rationales for the use of these technologies in combination to promote maximum brain potential. Come to this presentation with specific cases in mind and share in this cross-disciplinary multi-media discussion. The specific motor skill that is practiced is as important repetition for the successful habilitation/rehabilitation of motor skills following neurological injury. IM is also uniquely suited to facilitate the neuromuscular communication needed to restore shoulder balance post injury, as well as providing performance-based visual and auditory feedback in order to develop neuromuscular balance of the proximal wrist and carpal joints and facilitate dexterity and fine motor manipulation following injury to the hand. Learn how to adapt & individualize IM training to address motor timing & rhythm for neurological conditions like hemiplegia, ataxia, and dyspraxia as well various orthopedic conditions impacting the hand, wrist, elbow and shoulder for more rapid and extensive treatment outcomes. With a good knowledge of the impact of IM on impairments of the elbow, the clinician can develop a candidacy for the program and adapt the technology appropriately. related to the anatomy, physiology, kinesiology of the elbow. With a good knowledge of the impact of IM on impairments of the elbow, the clinician can develop a candidacy for the program and adapt the technology appropriately. related to the anatomy, physiology, kinesiology of the hand. With a good knowledge of the impact of IM on impairments of the hand, the clinician can develop a candidacy for the program and adapt the technology appropriately. the anatomy, physiology, kinesiology of the shoulder. With a good knowledge of the impact of IM on impairments of the shoulder, the clinician can develop a candidacy for the program and adapt the technology appropriately. within this population group – a key to treatment planning, therefore, is flexibility in its customized application. As length of stay and duration of rehabilitation are under constant scrutiny, it is vital to approach clinical management of patients with ataxia with fresh, creative and effective modalities that measurably demonstrate a patient’s progress. This course will provide a broad base of knowledge to cover all clinical establishments and to give IM providers the tools they need to transition to the next step in treatment planning and in applying their use of the IM toward functional treatment outcomes. Course material will be in power-point style with easy to reference lists and learning tools. Photographic examples and video media will be presented to illustrate salient points. help with its remediation. Key to an IM provider’s skill base is a repertoire of modification strategies in order to provide an individualized treatment plan. As length of stay and duration of rehabilitation are under constant scrutiny, it is vital to approach clinical management of patients with fine motor deficits with fresh, creative and effective modalities that measurably demonstrate a patient’s progress. This course will provide a broad base of knowledge to cover all clinical environments and to give IM providers the flexibility in approach needed to apply Interactive Metronome to functional goals and transition to the next step in treatment planning. Course material will be in PowerPoint style with easy to reference lists and learning tools. Photographic examples and video media will be presented to illustrate salient points. This course reviews normal human movement with transfers, gait, and stairs. Treatment plans incorporating interactive metronome are helpful in improving functional mobility, both the quality and speed of movements. Interactive Metronome (IM) exercises are presented that target specific improvements in common movement impairments seen in neurologically impaired patients. help with its remediation. A key factor is the IM Provider’s repertoire of modification strategies in order to provide an individualized treatment plan. As length of stay and duration of rehabilitation are under constant scrutiny, it is vital to approach clinical management of patients with hemiplegia with fresh, creative and effective modalities that measurably demonstrate a patient’s progress. This course will provide a broad base of knowledge to cover all clinical environments and to give providers the flexibility needed to apply IM to functional goals and transition to the next step in treatment planning. Course material will be in power-point style with easy to reference lists and learning tools. Photographic examples and video media will be presented to illustrate salient points. With a good knowledge of the impact of IM on peripheral nerves and the neuromuscular balance deficits and pain they cause, the clinician can develop a candidacy for the program and adapt the technology appropriately. This course will review these technologies and provide the therapist with guidelines and techniques that will help facilitate his or her ability to integrate the Interactive Metronome with these other technologies. This course is designed to help you think “outside the box” and use the IM in conjunction with other modalities such as the Constraint Induced Therapy Program to help facilitate the patient’s ability to drive neuroplasticity in motor recovery for rehabilitation of the upper extremity. improve this functional life skill. This course will show how to incorporate various intervention approaches into IM treatment to help improve pre-writing, letter formation, sizing, spacing and alignment. These intervention approaches will include neurodevelopmental strategies, motor learning strategies, sensorimotor strategies and biomechanical strategies. The course will also show how to document and communicate improvement and using this documentation as a motivational tool. Neural timing & synchronization are at the heart of many neurological conditions like Parkinson’s and Tourettes. Learn how to adapt specific exercises to meet the unique needs of these client populations. Although there is no known cure, the individuals diagnosed and their loved ones are highly motivated to access services that can enhance independence and quality of life. The Interactive Metronome has been used successfully as part of the therapy services offered for both newly diagnosed patients as well as those who are experiencing significant functional declines. Psychological treatments can help a person learn new techniques for social interactions. But what about the reduction in size of the hippocampus as a result of sustained PTSD? What about the shearing of dendrites as a result of stress on the neurons? I believe that 15 sessions of IM drove my “motor gate” into creating greater neurogenesis in the hippocampus and greater neuroplasticity of connecting longitudinal fibers. I will share this personal information with the desire that you will offer IM to others who are struggling with PTSD. What can you do to help a client with Tourette excel at IM training? Participants of this course will demonstrate better understanding of this unique clinical population, best practices for IM training, and anticipated outcomes. Children with early speech and language disorders are at greater risk for developing reading problems later on. Many of these children have difficulty with processing speech sounds. Subsequently, exposure to fewer and less complex reading materials over time negatively impacts oral language skills. Research has repeatedly shown that IM impacts reading fluency, rate and comprehension. These webinars will provide you with practical tips for IM training & best practices to help children reach their reading and language potential. This webinar will discuss implementation of IM as an integral tool in the remediation of reading disorders such as “dyslexia”. The course will discuss the various techniques implemented to improve reading, writing, spelling and comprehension. Sensory signals received by the central nervous system do not become organized into an appropriate response in individuals with SPD, making it difficult to process and act appropriately. SPD and ADHD can lead to difficulty with academics, peer relations, and carrying out activities of daily living. Find out how to adapt your approach & settings to optimize your IM training outcomes for individuals with SPD & ADHD. tolerating headphones and staying on task.This webinar has been prepared to identify some of the challenges that may befall a client with Sensory Integration issues as they participate in an interactive metronome program. IM practitioners, in turn, will learn how to recognize sensory integration “red flags” that influence client performance and make appropriate IM related accommodations. This webinar is not designed to train an IM practitioner to become an expert in Sensory Integration, but rather as a tool to identify sensory triggers and as a knowledge base to refer on to specialized services as indicated. IM practitioners will learn how to customize their treatment programs to address clients with a variety of sensory triggers. Practitioners will increase flexibility in their approach to IM training and, ultimately, further support the successes of their clients. Course material will be in powerpoint style with easy to reference lists and learning tools. Many photographic examples will be presented to illustrate salient points. Is it Neurological Reorganization or Sensory Overload? Particularly prominent in the pediatric population, many providers are reporting functional changes during IM that may be interpreted as an expression of the sensory system, or may be due to subtle changes in neurological reorganization. How to identify systems within the central nervous system versus core neurological changes can be quite the challenge, and often a cause for worry. Issues such as perceived functional regression and negative reactions may easily create cause for confusion and concern. This presentation will attempt to clarify key points. Upon completion of this course, providers will demonstrate greater flexibility to create IM programs with more precision & successful outcomes. Providers will learn to guide family members and care staff through the process. Course materials will include easy-to-reference lists and learning tools. Photographic and video examples will be presented to illustrate salient points and reinforce learning. Sensory processing disorders are often seen in children with developmental delays, Autism Spectrum Disorder, Asperger’s Syndrome as well as in typically developing children. The use of Interactive Metronome can significantly improve the sensory integration of these children and improve their quality of living. This course will educate participants on the sensory systems (visual, auditory, tactile, olfactory, vestibular, and proprioceptive) and how to coordinate and adapt sensory strategies with the use of IM. This course will also focus on the case study of one child with Autism who has undergone treatment of IM using sensory strategies and how his fine motor, gross motor, social interaction, and overall sensory processing as improved due to IM treatment. Many clients who use Interactive Metronome have ADHD and/or sensory processing disorder. These diagnoses carry unique challenges for the use of I.M. This course will help Interactive Metronome practitioners use sensory strategies to assist clients in achieving their goals. Dyspraxia, often thought of as motor planning, involves difficulty coordinating cognitive planning and sequencing to execute skilled motor actions. Jean Ayres, PhD, was the occupational therapist who pioneered this theory and developed the formalized evaluation process and child-directed therapeutic intervention to address these areas. Many of the underlying senses involved with sensory processing and praxis problems can be addressed with the Interactive Metronome. Using rhythm and timing inherent to IM activities can serve as a complementary intervention to classical sensory integration therapy. Those Guide Sounds Are Driving Me Crazy! With the unique flexibility provided by the Interactive Metronome, providers are able to address these goals for their clients while using their discipline-specific skill sets. This course will provide examples of different ways to use the Interactive Metronome equipment to work on auditory goals with a variety of populations and needs. Research shows that an individual’s ability to synchronize motor movements with a steady auditory beat is directly linked to the auditory brainstem’s response to sound. Those that can synchronize more accurately, as measured in milliseconds, have less neural jitter and can produce and process sound more accurately, leading to more normal development of speech, language and literacy skills. On the other hand, those that struggle with timing & rhythm have more neural jitter in the auditory system resulting in disordered development. Learn more about integrating IM into pediatric and adult SLP practice for improved treatment outcomes. The presenter will share key principles of an IM intervention chronology and assessment along with five case studies. Participants will learn skills to incorporate valuable speech, language, and social/pragmatic assessment measures for documenting IM outcomes. The purpose of this course is to teach IM providers to incorporate gross and fine motor movements into IM training sessions to facilitate vocabulary development. Developmental milestones, neuroplasticity, and cognitive development will be discussed within the context of learning to address a wide variety of diagnoses. Activities will be demonstrated and can be modified to meet an individual child’s needs. This course will provide a wealth of supplemental fun activities that can enhance language remediation in conjunction with using Interactive Metronome. Activities will infuse rhythm into your language treatment protocol that can be used before or after Interactive Metronome during your language remediation sessions. Treatment strategies will be presented for integrating timing & rhythm (via Interactive Metronome) into traditional aphasia therapy, including treatment materials for use in your clinic. the role audiologists have taken in recent years to implement treatment of A.P.D. in their practices; and lastly specific cases will be discussed along with the individualized protocol used in implementing IM in their treatment plan. Interactive Metronome (IM) provides a unique application of timing & rhythm by not only providing the stimulus for timing (or the cue), but also feedback for timing at the millisecond level so that the patient can improve mental timing critical for speech, language, and cognitive-communicative abilities.Read MoreRead Less The primary goals of this course are to provide a rationale for integration of this technology into the practice of speech-language pathology and instruction on its clinical application. In particular, this course will cover the application of newer technology (such as the insole trigger) to address rhythmic cueing for cognitive-communicative skills within the milieu of a functional dynamic environment. This course will delve into the need for collaboration between the Speech-Language Pathologist, Occupational Therapist, and the Physical Therapist and how to go about it in your practice or your school. Help your athletes find the “zone” to increase accuracy, decrease variability and achieve automaticity of execution in sports. These informative courses provide information regarding the scientific basis for use of IM with amateur and elite athletes as well as detailed instruction for customizing training for specific sports. The IM has primarily been used for neurologically impaired or special needs individuals, but applying it to the orthopedic “normal” has been quite a success in my practice, and in this population the learning curve for skill acquisition has been dramatically reduced, motor patterning has improved, and successful completion of elements such as jumps for the athlete are more consistent by far. All of the spinal positions necessary for pelvic control in the figure skating athlete will be addressed as well as functional custom exercises for each individual which will be based on their discipline in the sport. A physical therapy evaluation and assessment with the IM will determine the progression of patient tasks, based on muscular imbalances found. IM training has the potential to fill the gap that currently exists between unique sporting skills, identified as necessary for peak performance, such as rhythm and timing, focus, decision making and concentration, but not yet filled in regular sports training programs. An important aspect of combining IM training with regular sports programs, is identifying the unique requirements of the individual athlete’s performance through observation and analysis , then applying this knowledge to formulate a program specifically tailored to the individual’s needs. Previous research and documentation using the IM in sport, has focused primarily on a “one size fits all” type of program. Standard 12 exercise programs for any sport. During this presentation, I will take IM training a step further by changing and expanding existing IM exercises which can be created based on athlete sport observation and analysis. To personalize IM programs for athlete’s it is important to identify and analyse the physical, mental and environmental factors sporting athletes encounter, and then the applications involved to plan a sport specific IM creative program, that both simulates and challenges various athlete components discovered during the observation period. I will take you through a step by step example of how observation and analysis of a hockey goaltender, combined with creative brainstorming and adaption of IM exercises, produces a personalized, challenging, sport specific IM program for hockey goaltenders. but focusing primarily on the physical and mental demands of tennis players. IM training has the potential to fill the gap that currently exists between unique sporting skills such as these, identified as necessary for peak performance, but not yet filled in regular sports training programs. An important aspect of combining IM training with regular sports programs, is identifying the unique requirements of the individual athlete’s performance through observation and analysis , then applying this knowledge to formulate a program specifically tailored to the individual’s needs. Previous research and documentation using the IM in sport, has focused primarily on a “one size fits all” type of program. Standard 12 exercise programs for any sport. During this presentation, I will take IM training a step further by changing and expanding existing IM exercises in to sport specific, challenging exercises that meet the individual demands of tennis players, identified though the observation and analysis process. To personalize IM programs for athlete’s it is important to identify and analyse the physical, mental and environmental factors sporting athletes encounter, and then the applications involved to plan a creative sport specific IM program, that both simulates and challenges various athlete components discovered during the observation period. I will take you through a step by step example of how observation and analysis of a tennis player’s game, combined with creative brainstorming and adaption of IM exercises, can produce a personalized, challenging sport specific IM program for tennis players that address the multiple demands that are present for athlete’s to perform tennis an elite level. and in this population the learning curve for skill acquisition has been dramatically reduced, motor patterning has improved, and elements such as musicality, coordination, motivation, and goal setting for the athlete have been improved. Music “is the gateway to the soul” and brings out the best in patients. All of the spinal positions necessary for pelvic control in the dancer will be addressed as well as functional custom exercises for each individual which will be based on their specific activity. A physical therapy evaluation and assessment of pelvic control with the IM will determine the progression of patient tasks, based on muscular imbalances found. Hall of Famer, Warren Spahn, while speaking of pitching, gave great insight to the art of hitting when he made the statement, “Hitting is timing, pitching is upsetting timing.” Hitting is timing! That seems too simple, or is it? Timing is just one of the training areas that the Interactive Metronome can address for softball and baseball players. During this webinar we will explore the importance of other sporting skills such as focus, concentration, rhythm, coordination, balance, motor planning and sequencing, and decision making; skills that are vital in any sporting performance, particularly in ball players. IM training has the potential to fill the gap that currently exists between unique sporting skills such as these, identified as necessary for peak performance, but not yet filled in regular sports training programs. An important aspect of combining IM training with regular sports programs is identifying the unique requirements of the individual athlete’s performance through observation and analysis , then applying this knowledge to formulate a program specifically tailored to the individual’s needs. Previous research and documentation using the IM in sport, has focused primarily on a “one size fits all” type of program. Standard 12 exercise programs for any sport. During this presentation, I will take IM training a step further by changing and expanding existing IM exercises into sport specific, challenging exercises that meet the individual demands of softball and base ball players, identified though the observation and analysis process. To personalize IM programs for athletes it is important to identify and analyse the physical, mental and environmental factors sporting athletes encounter, and then the applications involved to plan a creative sport specific IM program, that both simulates and challenges various athlete components discovered during the observation period. I will take you through a step by step example of how observation and analysis of specific skills and movements, mental and environmental demands that softball and baseball players face, combined with creative brainstorming and adaption of IM exercises, can produce a personalized, challenging sport specific IM program that can address the multiple performance demands present for elite ball players. Some of these skills come naturally to some players but must be learned by others. Whether naturally skilled or not, all players must hone their soccer-playing skills to be competitive. Physical skills that must be learned and mastered in order to play competitive soccer include stamina, speed, strength, reaction, ability and coordination. Reaction and coordination are skills that typically come naturally, but can also be improved through extensive and repetitive practice. Game-specific skills need to be developed for soccer players to effectively play the game. Specific skills include dribbling, heading, passing and punting. When developing and refining dribbling skills, players use all parts of their feet to pass, change direction and kick the ball. Physical abilities come into play as players use their spatial awareness, peripheral vision, speed and agility to effectively play the game. Soccer requires several mental skills that enable players to understand the rules, formations, position responsibilities and objectives of the game. Players must exercise their mental skills to keep track of vital game information. IM training has the potential to fill the gap that currently exists between unique sporting skills such as these identified as necessary for peak performance. An important aspect of combining IM training with regular sports programs, is identifying the unique requirements of the individual athlete’s performance through observation and analysis , then applying this knowledge to formulate a program specifically tailored to the individual’s needs. Previous research and documentation using the IM in sport, has focused primarily on a “one size fits all” type of program. Standard 12 exercise programs for any sport. During this presentation, I will take IM training a step further by changing and expanding existing IM exercises in to sport specific, challenging exercises that meet the individual demands of soccer players, identified though the observation and analysis process. To personalize IM programs for athlete’s it is important to identify and analyse the physical, mental and environmental factors sporting athletes encounter, and then the applications involved to plan a creative sport specific IM program, that both simulates and challenges various athletic components discovered during the observation period. I will take you through a step by step example of how observation and analysis of specific skills and movements, mental and environmental demands that soccer players encounter, combined with creative brainstorming and adaption of IM exercises, can produce a personalized, challenging sport specific IM program that can address the multiple demands present for soccer players. Furthermore, it will focus on the customized and standard IM-exercises utilized during the experiment and the reasoning behind the choice of exercises. Methods used in the present experiment and the methodological issues that emerged during and after the experiment was conducted will be discussed at length, including choice of tempo (bpm) for training exercises, number of repetitions, length of training sessions, type of sensory feedback (auditory and/or visual), the difference between timing- and rhythmicity-skills and their measurement, as well as suggestions for future research. Moreover, this webinar will highlight and exemplify the importance of capturing outcomes with “non-IM” pre- and post-test measures of motor control when working with the Interactive Metronome in any situation or context. This webinar has its starting-point from a published scientific paper that examines the effects of IM-training on the above mentioned kinematic characteristics. The webinar further aims to explain what variables of golf swing performance/execution that the IM-training affected. More specifically, we will delineate whether IM-training influences the timing and rhythm variables, or the co-ordination and synergy of the golf swing performance. Moreover, we will discuss possible ways of interpreting motor performances, as well as highlighting theories within the motor-timing domain that may give us a better hunch about how timing and motor control relates. In short, the webinar focuses on the influence of IM training on the kinematic properties of golf-swing performance, the methods used to assess possible changes in golf swing performance, and the theories that best explain our findings. (cross-pass, shot for goal and heading), but will also address some of the customized IM-exercises used, and the reasoning behind the choice of these specific exercises.Read MoreRead Less Moreover, the webinar will include some preliminary analyses of brain activation patterns (fMRI) before and after IM training. Here, we have investigated if the internal / cognitive representations of an observed action may change as an effect of IM training. Help your clients achieve their goals even though they can’t make it in to see you with enough frequency for direct IM training. These courses are presented by providers with years of successful IM Home implementation with the goal of sharing best practice tips & strategies for optimal results. The concept of Virtual training offers both the clinician and the client ease of use and all the benefits of traditional IM Training. Upon completion of the course, you will be able to determine candidacy for IM-Home Virtual Training, assess individual client needs based upon Short and Long Form Assessment, develop individualized virtual treatment plans that are synchronized to your patients’ computer when they log in (eclinic), fine-tune or revise treatment plans based upon patient comments/feedback, review detailed session data and patient comments about their in-home sessions to aid you in troubleshooting their care, and send/receive messages to guide the treatment process. You will learn how to teach your patients to view detailed session reports to better track their own progress, to enter comments after each treatment activity as needed, and to communicate more efficiently with you via eClinic. You (the Clinician) will also learn about the benefits of Virtual Training from a business marketing and profit standpoint. This course is offered only to IM-Home Certified Providers. Lisa Poe, an experienced IM Provider, IM Instructor, & IM-Home Specialist, will share tips & strategies developed in clinical practice to elicit the most from each client with regard to motivation, compliance & performance in order to achieve optimal results. Lisa will discuss age-specific training considerations, specific tips & motivational strategies, including “tools” that can be found in and around the home to enhance motivation toward training and results. Several photos and videos have been incorporated into this presentation to best illustrate the ideas shared. This presentation will focus on the fundamentals of business planning for clinical success and profitability with IM Home. It will look at the components of the IM Home business model, including the target patient population, options for providing training to the patient, how to manage and track costs, how to price the IM Home, and how to bill, including cash and insurance billing. The presentation will include examples and case studies for a wide variety of clinics and providers. Just like motor coordination & auditory processing, the brain requires precise neural timing for visual processing & executive functions. These courses focus on specific adaptations of IM to address these important abilities. Part I of this advanced training in Interactive Metronome will enhance clinicians’ assessment and treatment outcomes for visual attention & processing, critical components in reading comprehension, balance, and functional independence through isolating the visual component of IM. Rationale, candidacy, pre & post assessment, specific IM treatment tasks, and visual (alone) IM treatment hierarchy will be discussed. Participants are strongly encouraged to attend Part II of this course titled: Improving Visual Processing & Executive Skills with IM. Part 2 of this advanced training in Interactive Metronome will enhance clinicians’ assessment and treatment outcomes for visual attention, processing, & executive functioning, critical components in reading comprehension, balance, and functional independence through use of supplemental visual stimuli and various visual treatment tasks that are combined with the Interactive Metronome reference tone and guide sounds. Rationale, candidacy, pre & post assessment, specific IM treatment tasks, and auditory-visual IM treatment hierarchy will be discussed. PREREQUISITE: Participants of this course must first take Part I titled: Improving Visual Attention & Processing with Visual Only IM. With the unique flexibility provided by the Interactive Metronome, providers are able to address these goals for their clients while using their specific discipline skill sets. This course will provide examples of different ways to take advantage of using the Interactive Metronome equipment to work on visual goals with a variety of populations and needs. Cancellation: IM reserves the right to determine the appropriate recourse for any CE activity for unforeseeable circumstances. Self-studies are non-refundable (including online webinar recordings and hard copy manuals/educational materials).